The Oil Drum | Can Acts of God and Bush Explain the Plateau? The Extraction of Exhaustible Resources The Oil Drum Problems in the UK. Can Acts of God and Bush Explain the Plateau? Recall that just before Christmas, we were discussing the apparent bumpy plateau in world oil production since last year. This picture, to be specific. (However, the version here has been updated with the EIA's October number and slightly revised August and September numbers and has also had a graphic facelift). Peaksters can get excited all they want watching the mid 2005 plateau and read into it what they want but the rest of us know it was hurricane and refinery related and the trendline will continue into 2010 amid the gnashing of teeth. 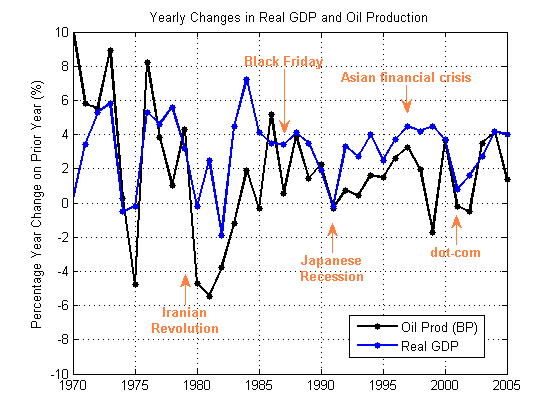 As you can see, if the various problems had not have occurred, we would have had more oil and slightly less volatile supply. However, the plateau shape doesn't go away. If anything, it's a little more pronounced. So I think to argue that the recent plateau is explained by hurricanes is to select only those factors that fit one's desired outcome. Looking at the broader picture, the plateau cannot be explained by the acts of God and Bush. Excellent work, kudos! I applaud any effort to try and determine how long the roller-coaster will ride the plateau before it finally starts an obvious downslope. Geology should be the dominant driver, and trying to correct for the perturbations caused by politics and weather is important. This can reveal the basically smooth underlying aggregate production curve over time, and when the anomalies are accounted for, then additionally graphed in: a more true time domain picture emerges. The differential rate of change along the peak is small [the slope changes slowly], so the effects of politics, weather, accidents, pricing policy changes, equipment availability, employee shortages, etc tend to be greatly magnified causing short time frame jaggedness or sawtooth action to the graph. Basically, any efforts to improve the signal to noise ratio helps everyone. Just another reason to backup Matthew Simmon's call for total oilfield transparency. Very good work, thanks. But it is of course too early to say that we are at the peak plateau now. But this is the year 2006 and we are very close to the revised ASPO peak year of 2007. Bad data and random factors make it impossible to predict even at one year precision, so we have only to wait and see. Russia is the one we should watch extra closely. Don't refineries have more accidents when the cokers become corroded due to an increase in contaminants in crude as light crude runs out leading to an increase in heavy crude? Aren't the hurricanes and typhoons due to increased greenhouse effect from China's increased industrial base from US outsourcing that started in the 1980's as US oil peaked? I don't think we can say that the hurricanes are absolutely due to global warming yet, but it's certainly possible. In any case, you raise good points. Many of the factors mentioned are depletion related, tangentially anyway. Why are we in Iraq? Not to free the Iraqi people, that's for sure. And we can surely expect war and unrest to increase as the effects of depletion spread. My intuitive idea was the following : at a given moment in the world there will always be x% of production cut out because that is the way things work. So the slope of the actual flow of oil is the real display of the underlying capacity. But now this feeling has its statistical demonstration which is very comforting. In this overall picture, I don't know if the individual behaviour of such or such country will matter a lot : an increase or decrease in production in one point can and will be compensated by another event elsewhere. This is the effect of international competition modulated by random events. I'm looking forward on how you will integrate the refining capacity into this picture. Will you try to show that this is or not a factor in this actual plateau ? I don't believe that the constraint of refining capacity is the main facteur in the 2005 production plateau because if this would be teh case, the crude price should drop dramatically while endproducts should become very expensive or not ? If you have less refinery capacity, in effect not enough to process all the available crude, then doesn't that mean that crude supplies pile up waiting to be processed? Doesn't that mean that crude prices should fall as the stuff lays about waiting for processing? Wouldn't we be swimming in unprocessed crude? Doesn't that mean a disconnect between crude prices and refined product prices? Is that what we are seeing now? Crude prices will only fall in the face of a lack of refinery capacity if the oil producers keep pumping at a higher than needed rate. The oil producing companies and countries are generally very good at modulating output to maintain at least an acceptable price level. In theory it would work as you say, but in reality the decision-making entities involved react in real time to the situation. This is a good example of why I'm so unhappy with many of the static analyses (both optimistic and pessimistic) I see about energy issues--there is very often just one little, buit ever so critical, detail missing from the model that makes all the difference. My impression is that Freeddy Hunter's view of the world is not as far from your as some of the doomsters here, it is just more to the conservative side. If you could plot the range of opinions here on a chart, I think the "end of the world as we know it" contingent deviates from your analysis more than Feddy does. I guess my current view is my own particular mix of pessimism and optimism. The balance of the evidence at the moment suggests to me that there is likely to be a near-term peak in crude production (something that Freddy would not agree with), but that the post-peak decline rates will, at least for some time, be within the adaptive capacity of the economy, allowing at least some continued economic growth (possibly after a nasty short-term setback or two). That is something few "doomers" would agree to. I reserve the right to update my opinions based on new evidence at any time, however. Respect, Terrier, for doing the work and making such a good post when you already knew how it would turn out. The crux should come within the next year or two at most, can we increase from this plateau level or do we continue to bobble along it until we fall off steeply or gently? It looks like a plateau regardless of whether you stroke it or kick it. Decline rates will be the key and I am less sanguine on that than you currently seem. My brain is semi-functional atm so I haven't responded on Dave's "The Extraction of Exhaustible Resources" which could be the most significant post I've read here. I fear what that implies, and think it will be = steeper than expected. Like infrastructure, the economy is less flexible and adaptive than you presume, though that lesson may be a year or two ahead in its knowing - laws which appear true in an equillibriam state are sometimes found wanting when that equillibriam is disturbed. Thanks Stuart. My own view mirrors your almost exactly. My faith in the adaptive capacity of the economy comes more from a belief that we can sheer off significant amounts of current use, rather than an expectation that alternatives can be put in place in the near term. So, I do not think the optimistic demand and supply projects from EIA, IEA and others will be met. Rather, I think we will make do at a lower level of consumption and production. I agree that a nasty short-term set back is a distinct possibility. I also think it is likely that the impacts are not uniformly distributed. I don't see a global crash, but do expect that those who are more dependent on cheap oil (McMansions/SUV owners, Some Asian economies) will be hurt worse. However, I am still optimnistic enough to think that the ignorant will be hurt less than the overreacters. Stuart, you bring up an interesting theory that post-peak oil will allow some economic growth due to the adaptive capacity of the economy. This might be true. Is that you're idea of optimism? I mean, what is the use, if there is some economic growth for a tad bit more, while the whole American system of daily living implodes just a few years later? The banking sector is built upon the fact that energy must be increased in order to keep the system going. What will people do when those few years of the so called "economic growth" are gone...and we are in a long depression? Things today are much different than in the 1930's. We won't be able to ramp up the industrial factories or build large infrastructure projects...as the cheap energy will not be available. If one's idea is to make as much money as possible before the collapse really starts to take place....buy a small farm in the country as well as gold and silver...I don't know what a few more years of economic growth will do to people who want to live a long life and watch their children grow. Reservoirs and other emergency reserves can buffer the effects of shocks, serving to delay the effects by a bit. The analogies to an RC circuit with the reserve capacitance acting as a cushion should not be discounted, depending on how oil production gets tallied. I think overall that the capacitance effect here is insignificant in the long term but it may show up on short time scales. The most immediate production decline was due to the hurricanes. The key point is that this shortfall could not be made up with existing production, and a coordinated release of emergency reserves was necessary to bring the price back down below $70 per barrel. The world, at about 50% of Qt, is precisely in the middle of the range between the Lower 48 peak, at 48%, and the North Sea peak, at 52%. These two regions have shown irreversible declines post-peak. Hold on to your hat. IMO, it's all downhill from here. What would that say about decline rates, you'd say? Since the place of the peak in relation to the amount of Qt has to do with the (amount of) use of modern secondary recovery techniques, which make decline rates higher, if I recall properly..
Hubbert linearization tends to suggest that average decline rates will be quite modest (not to suggest that there might not be some pretty bad years in there, but on average, it projects a modest decline rate). See this post. Secondary and tertiary recovery methods in the North Sea have caused the rate of decline to increase far beyond what Hubbert envisioned. I would think that that much would be obvious to everyone. Applying the same decline rate we enjoyed to the rest of the world is a bit "head-in-the-sand" in my opinion. The rest of the world has enjoyed the benefits of enhanced recovery technology in order to maximize profits. The water cut in the Ghawar is immense now, and the profile it exhibits is much like Yemen's Yibal field which experienced a dramatic collapse in a very short period. While counting the hairs in the nostril of a charging grizzly may be interesting, it is not helpful. Dr. Robert Hirsch spoke to Global Public Media and expresses his concern about the probability that we are beyond the 20 year threshold of expedited remediation and technology switchover. We simply do not have enough time to provide a smooth transition. Yes, but the Hubbert linearization predicted North Sea decline rates would be very high, and it doesn't predict the same for the world. Sure, but the reason for our conclusions is based on the fact that Hubbert Linearizations have been successfully applied to megafields (eg. Cantarell is toast) and not that "vague" other category in which the world gets a lot of its supply from a diverse set of smaller sources. Looking into the future, it is the assumed successful and consistent production from these numerous but small sources (mbpd for eg. Chad, Mauritania, you name it) that makes everything work. When CERA or other optimists make their predictions, there is always this large category for new supply called "Other". I for one tend to worry about that with respect to the "world" peak for oil production and I'm sure you do too. Well, the reason for my confidence that Hubbert linearization is useful is that it seems to have worked as a decent rough approximation for whole countries, big fields and small together. If it's only successes were individual fields, there'd be far less basis for trusting its extrapolations. My view is in accord with your own but I wish I knew more about these other small countries which individually are marginal suppliers but added up all together are claimed to be a major source of new supply--at least according to some well-known consultants who shall remain nameless -;) Just looking at megaprojects and large declines in big oil provinces is only part of the story. I myself have held onto a bias that tends to ignore those hundreds of millions of barrels available in off-shore Mauritania. I haven't (and still don't think) they matter at all in the big picture. I think it's worth raising the issue in any case. By the way, in Bubba's post on non-OPEC production, it is apparently predicted by his proprietary source that we can see a rise in Ecuador's production. I'm so glad! We are saved! Well, I can give some information about one other small country, Brazil. We are going strongly for the ethanol and biodiesel and when I say we I am saying the consumers and the federal government and Petrobras SA. Aparently Brazil's crude oil will peak around 2010. We are geting crude oil under hard conditions, our oil come is offshore and the new fields are under 1000 meters water, so the new fields will not give their oil cheaply or easily. When you need to use robots and not humans for make the under water work the exloration cousts will not get down. My guess that the thecnology limit for offshore exploration can go to 3000 meters under water, but that will be not possible economically (the cousts will be prohibitive, the crude oil need go to US$ 1000 price before you can have profit exploiting oil under 2000 - 3000 meters under water. So, CERA's predictions for Brazil are plainly wrong. My guess is that other CERA's predictions for the small countries are plainly wrong too. However, ethanol and biodiesel will not save us. We can MAYBE produce enough ethanol from sugarcane to mantain our automobiles. I have no idea how much biodiesel we can produce, but we are trying use oil from native tree species that have a higher oil production than soyan beans. I am not sure if will work. I fear that the ethanol and biodiesel prices will follow the crude oil's prices, so the biofuels will only make sure we have no shortages (I hope), but we will have a lot of economic pain. Moreover, our electric power come mostrly from hidroeletrics power generators and not from termeletric generators. So, oil and gas prices will not affect too much the eletricity prices here at Brazil. But we will need build more hidroeletric generators and there are not enought rivers where we can build dams out the Amazon Basin. I think that can be a good idea we go strongly for eolic power, mostly because our semi-arid Nordeste is a good place to build wind turbines (and maybe some solar energy too, few rain there). I suspect that nuclear energy will be not a solution for Brazil, mostly because it is not wise substitute a finite non-renewable energy suply for other finite and non-renewable energy supply. We don't have too much money, so can be better we use the few money we have to build wind turbines than build expensive nuclear reactors. By the way, what we will do with the nuclear waste? Excellent work. But looking at that plateau, I have to ask: Is it due to declining supply, or is it due to a demand response to dramatically higher prices? Isn't production linked to demand, and doesn't demand decline after a price spike? Matt Simmons addressed this point in the Barron's interview. He has not seen any reduction in demand yet, and in fact the most recent U.S. consumption numbers show record high demand--corresponding to record high nominal oil prices. Every time I hear Simmons or anyone else say something like this, I want to scream. People never seem to ask: What would demand have been if the price had NOT gone up? Obviously, higher than it actually was. I know, Simmons is making a point about the total demand and its long-term consequences, i.e. he's taking the "geologic viewpoint," not the short-term "market viewpoint." That's perfectly valid, but I very often hear people cite these kinds of numbers and make the logic error of saying, "Price and demand both went up, so demand is price inelastic." That's only true if you adjust the demand for changes in all other non-price factors (including economic and population growth, businesses shifting some energy demand from NG to oil, etc.) and still see no decrease. In fairness Lou, you constantly hear economists talk as though price was the main effect on demand, whereas the price elasticity of demand is in fact much smaller than the income elasticity (in so far as either concept is well defined - which is only as very rough approximations). It takes a lot of price change to overcome a little GDP change. Barron's: What about the argument that demand will adjust to meet supply? Simmons: The likelihood of demand stopping is zero, unless we have a bird-flu pandemic. Demand is still accelerating. For the top 25 emerging markets, GDP [gross domestic product] change year-over-year is averaging up 5.5% for 25 countries. Argentina is 10.1%. Chile is 5.2%. China is 9.4%. Hong Kong, 8.2%. India, 8%. Indonesia, 5.3%. Malaysia is 5.3%. The Philippines is 4.1%. Singapore is 6%. Embedded in that is a continuation of an inexhaustible increase in the use of oil, particularly in the countries where they are barely using any oil. The wealthier they get, the faster they start using oil. The idea that $60 oil is really hurting the emerging economies is a myth. It doesn't seem to be affecting them at all. The Energy Information Administration numbers that came out recently showed the U.S. crossed 22 million barrels a day of petroleum use, a brand new record. So it is not stopping the U.S., either. To everyone's surprise, the economy grew by 4% in the third quarter, even with the hurricanes. That was when we had almost $65 oil. It's difficult to separate out supply limitations from demand limitations. Economically speaking, supply and demand are functions of price. At a given price, a certain amount will be supplied and a certain amount will be demanded. As the price rises, supply increases and demand falls. The market sets the so-called clearing price where supply equals demand. Hence when we look at charts and statistics what we see can be equally interpreted as amount supplied or amount demanded. When the EIA and others report "demand" levels, they are really reporting consumption levels. Sometimes this can differ slightly from reported production levels due to small build-ups or draw-downs of stored oil, but that is mostly just a matter of technical definitions. So how do you tell a demand-driven peak from a supply-driven one? I would suggest that you look at the price. In a supply-driven peak, there is desire for oil that cannot be met. This will drive the price up. In a demand-driven peak there is ample supply but people don't want it (perhaps due to an economic slowdown). This will drive the price down. Unfortunately it's not clear how to apply this heuristic in today's volatile environment. Suppose oil production/consumption falls next year but the price also falls to say 50. This is a lower price than the last few months but is much higher than the last few years. So is this a somewhat delayed response to continued tight supplies? Or is it a short-term drop in demand due to other economic conditions? It could be interpreted either way. Demand has increased since 1983 in a very linear fashion. This can be represented in the graph below by a steady shift in the demand curve from left to right as we come forward in time. Also, at any given time the demand for oil is very inflexible; price has little effect on consumption. In my own experience, I can cut out the impulsive run to the hardware store on the weekend, but I still have to get to work every day. This makes the demand "curves" quite steep for any point in time. To try to get a ballpark WAG on what the slope might be, I looked at the data around Katrina, when we had a price spike of close to $10, and a consumption reduction of about 0.87 MNbbl/day, for a slope of about $-11.50/MbblPerDay. I have represented this slope below for every two years historically, then every year for 2006-2010. The supply curve, until the late 1990's, has been pretty flat - producers have been willing to just pump more oil with little or no increase in price, to appease the shift in the demand curve. But if PO exists, and we are close to or at that point, then supply has an upper limit, so the supply curve starts to go vertical. I've shown two scenarios. First, if we extrapolate the production increase from 2004 to 2005, out to 2010, we hit $95 per barrel at 2010. If we assume a peak rate of production of 85 Mbbl/day, then we hit $100 per barrel in 2008. Both scenarios assume no demand destruction; however, I've only increased demand by 1.54 Mbbl/day per year for 2005-2010. EIA predicts a demand increase of 1.7 Mbbl/day per year, so one could argue that there is some demand destruction built in. What about long run demand elasticity? If that is greater than short run demand elasticity, would that bring your oil price estimate down? ...and if 85mbd is all we can get out of the ground, then demand growth will HAVE to come to a screeching halt in the next 2 or 3 years. One of the things we have to guard against in discussing Peak Oil is having a US-centric or US+Western Europe-centric. I expect that their is a lot more demand elasticity on a world-wide scale than we would understand from a strictly US-lifestyle perspective. That elasticity, unfortunately, will come from poorer nations having different price thresholds than the US and Western Europe and being outbid for supply. I would definitely agree that people just getting a glimmer of our lifestyle will be the first ones thrown out of the SUV. We are 5% of the population using 30% of the world's oil. So let's get to work leaving some for everyone else. Nice work Stuart as usual! So you proved that recent geopolitical/weather events have not a significant impact on the large time scale shape of the production curve. They are rather acting like noise around the trend which is maybe driven by the geological constraints we are expecting. It also shows how important is the Iraq production compared to Hurricane disruptions. However, as dicussed in a previous thread (November IEA global production) these bumps in the production curve have been observed many times in the past and were due to temporary drop in demand growth (Asian flu, recessions, etc.). But without hard data on demand, how do we know for sure that this time this plateau is a consequence of a problem on the supply side? GDP has been increasing sharply through that period. 3rd quarter 2005 GDP was still strong at 4.1% (in the US). I think it is too early to see if 2005 is a particular year. Reductions in productiom growth seemed to have happened in the past despite strong GDP growth. Yes - the coupling between oil use and GDP seems to be less direct than that between VMT and GDP since there's an additional factor of efficiency of usage. See my discussion here. And I think that's more-or-less what's happening now. High prices have set in motion ways to reduce demand (such as shifts in auto purchase patterns). But it seems clear to me that the only reason those demand side responses are occurring is because supply could not increase enough to keep the price down. I think your labels miss various supply side effects that are important - the Arab embargo of 1973, the Iranian revolution in 1978, the Iraq-Iran war in 1980, and the Gulf war in 1991. These are pretty clearly visible in the production curve. Good work Stuart! This definitely sheds light on many things. It seems that your graphs are wrongly labeled in the x axis. The years should be what's there less one. Got the O&GJ data for 2005? We're all anxious. No, they're right. Each tick is a month, and only the January months are labelled. The EIA data in most cases only go through October, the but the hurricane shut-in they have through December, and Iraq production I interpolated from recent news reports of 1.1mbpd in December (I linearly interpolated November losses between the IEA numbers in Table 1.1a in October, and the news reports in December. Sorry - that "IEA" in the comment should be "EIA". Got to keep my three letter agencies straight. In short, the graphs are all on a horizontal scale from January 2002 to December 2005. That basically covers the period during which the economy has been recovering since the tech crash. This graph clearly demonstrates that while hurricanes and lack of refining AFFECTED production, they did not significantly change it. My question is did the price spikes seen around the hurricanes stem more from a tight supply - demand curve, or mass hysteria? As I remember it, the problem more stemed from hysteria - not only did supply shrink, but demand almost doubled (everyone in an SUV was topping off the tank, people horded gasoline in their backyard). Does anyone see this happening on a national level? Once people become PO aware will they change their consumption patter, or install a 500 gallon holding tank in their backyard? Did the fact that even I filled up before the hurrican contribute to the problem more than the loss of supply? regarding a 500 gallon holding tank. wouldn't the gas start breaking down after a prolonged storage? and not be as good? since it's not fresh? wouldn't it require large amounts of "stabil" to keep the fuel semi fresh? Really like this post, Stuart. The aphorism says that only death and taxes are inevitable but that's not true. Necessarily, we can look forward to more "acts of God" and geopolitical disruptions of supply. Your graphed data show the effect clearly--the production is lower and the shape is the same. Leaving God out of this and regarding Human Stupidity as a constant, I would say that the resulting increase in scarcity makes fights over resources more probable as time marches on. This can be viewed as a positive feedback loop. Unfortunately, "acts of God" are no longer all created equal. On the one hand, there are tsunamis due to plate tectonics. We can't do much about that. On the other hand, there are hurricanes where due to anthropogenic climate change, humankind would appear to be giving God an assist. I'm concerned that this graphic is misleading because the four year time period shown is rather special. We are coming off an earlier "plateau" around 2000-2002 which is not shown. If that period were included we'd see a flat, then a rise, then a flattening. The current chart instead gives the impression of a steady rise which has hit an unprecedented slowdown. I suggest that a longer-term time series would give a more complete picture. Certainly one has to bear the context in mind. I'm specifically choosing this time period because it is not, in my mind, contaminated by too much in the way of demand side setbacks. There was a drop in production from a peak of 79mbpd (EIA numbers) in March 2001, to a trough around 76mbpd in early 2002. I think that's almost certainly due to the slowdown in the world economy following the burst of the Internet/telco stock bubble and was not due to supply side factors. In contrast, from 2002 on we've basically had strong and increasing growth in the economy (until possibly the very end of last year but the jury is still out on that). Certainly through Q3 2005 we know US GDP growth was strong, European growth was no less than usual, and China/India was strong. Thus any plateau must be from the supply side (as I think you agree), and that is the phenomena of interest to me in this series of posts. Re: "the drop in production ... trough in early 2002"
Don't forget the effects of the 9/11 terrorism. Good point - especially on air travel. it appears that Iraq ramped up production during the oil for food program reaching capacity in mid 1999. After this capacity (fields in production whith no new development?) has declined fairly steadily at 7-8% per year. I would give the insergency much credit for the reduction. The disruptions after the March 2004 are smaller than than the interuptions before the war. It's certainly true that absent no investment, Iraq's existing oil production will decline naturally and some of that will have been happening. However, it appears to me that had US troops been greeted with uniform joy by the Iraqi population, we would have seen significant investment in Iraqi oil production by now, and Iraq has a number of large undeveloped fields, as well as ample opportunities to apply modern technology to the existing fields. So it seems to me that production could have been maintained and even increased if it wasn't for the security situation. Don't forget also that there was a significant amount of bombing of Iraqi infrastructure by US and British forces even before the ground war under the guise of maintaining the no-fly zone (though I don't know whether oil production was affected directly by that). I guess in summary I would say that there are significant uncertainties in assessing how much Iraqi production there would have been if we had left Saddam alone, or if we had invaded but there had been no insurgency, but I think I'm as likely to be understating the losses as overstating them. Iraqi oil production is not significant until actually needed to prevent a shortfall in (US) supply. The US is happy atm to use it as a punchbag to draw out terrorist attacks. Once the supply becomes important it will make the facilities more secure, increase production and take more direct control over them. Consider Iraq as the US's oil 'freezer'. But things rarely go according to (neocon) plan. Agric, i don't see it as conspiratorial. I have been thinking the same thing all along. The USA is just securing the oil. When oil supplies get tighter, the USA will be tapping into that oil. I'm not a prophet but thats the way i see it. Ambiguities abound in the interpretation of the data. How about this for a hypothesis: Peak Oil (supply side, geologically constrained) is unabiguously indicated only if you have falling refinery utilization, falling crude consumption/production and rapidly rising crude prices all at the same time. Right now, you have ambiguous data: high prices coupled with very high refinery utilization. Since the peak in crude production was easily foreseeable, predicted for decades and pretty much on schedule, it would have been incredibly stupid to over build refining capacity. Indeed, the prudent thing to do would be have built up refining capacity so that it was strained almost to the breaking point at peak. Muddle through a few years at the plateau and then begin retrofitting for the heavy grades that will dominate in the future. Bingo! As I've said before, this presents, to me, the most persuasive argument possible that peak oil is real, imminent, and that all the major oil companies and countries knew it was coming. Not only does the strategy you outline avoid the building of refineries that will be idled post-peak, but it helps constrain supply and push up price pre-peak. This enhances the oil companies' profits, and it also helps the world by sending a price signal pre-peak that will help restrain demand and therefore slightly delay and lower the peak. As they say, follow the money. Or in this case, the lack of investments. I found an open-source textbook on economics from a proffessor at Cal Tech that talks about demand elasticity. According to the sources he quotes, demand elasticity differs in the short run and in the long run for gasoline - short run 0.2, long run 0.7. "In words, the percentage change of total revenue resulting from a one percent change in price is one minus the elasticity of demand. Thus, a one percent increase in price will increase total revenue when the elasticity of demand is less than one, which is defined as an inelastic demand. A price increase will decrease total revenue when the elasticity of demand is greater than one, which is defined as an elastic demand." So, demand is affected more for gasoline in the long run (years) as price goes up than by short spikes. If this is correct, demand is still decreasing from last year's increase in oil prices. Yes, the 0.2 figure is widely quoted by economists, but pretty badly wrong as far as I can see on the US evidence. My estimate is 0.07 (a subject for another, very long and complex, post another time). It seems to me that 0.2 is already very inelastic, but I wouldn't be suprised if it is even lower in the short run, because of the difficulty of finding substitutes for gasoline quickly. I suppose that is the peak oil problem in a nutshell, now that I think about it. I will be very interested in reading your thoughts on demand elasticity. Thanks for provoking me to read up on this stuff in the first place! Stuart, I agree pretty closely with your 0.07, based on the slope I found for demand in my post above. Without boring everyone with the math, using 84mbd as demand at $60, and a slope of $-11.50/mbd for demand (a price increase of $11.50 will result in a 1mbd reduction in demand), I get a demand elasticity of 0.063. Of course, I am under the influence of cold medication, but I worked it through twice. P.S. I stole your gradient background idea on the charts, Stuart. Helps to make the charts more readable. The world oil price level is affected also by other countries than the US. The share of oil consumption of GDP varies and so the impact of the prices. So the US demand elasticity is only one factor among many (with a weight of 25%, about). Besides, we have the question of substitutes. Oil can be substituted with other fuel in heating, industrial use, power generation (worldwide there are many power plants using oil). About 30% of oil is used for other purposes than transport. 1 - 2% changes in the oil supply can be offset by other fuels - if they are available and the price is right. This affects the demand elasticity and the effect is different in different countries. Just a hunch but here goes: The combination of unique geology and modern extraction technology applied in the ME may well lead to high recovery rates until the very end. IMHO all the oil fields in the ME could use a rest to allow for oil migration to the production well sites. Whether Iraqi oil fields are exploited at the maximum rate at the present has little bearing on the ultimate oil recovery. The writing is on the wall. The bigger they are, the harder they fall. Ghawar will fall very hard some day soon. Witness Saudi Arabia investing in non-con oil production in Canada and elsewhere. What? They initially said they would increase oil production to 15 mbd for fifty years, now OPEC wants to lower production. What they are up against is clearly diminishing returns. Reminds me of that line from "The Blues Brothers". The gas station attendant says: "out of gas" and Belushi says: "yeah, could you fill 'er up?" to which the attendant says: "no, we're out of gas". That same scenario will soon play out in the ME. I sure hope the nations of the world don't use what's left of the world's petroleum in useless energy wars, but that sure seems to be how it is shaping up. Since Bush talks to God, then aren't acts of Bush the same as acts of God? Nice. I believe the answer is "Yes" but only in a very very deep sense which Bush himself misunderstands. We all talk to god, and/or we are all gods. Mankind's acts are our acts. It does no good to blame Bush, we elected him. He is not evil - indeed, there might not be another politician who says more of what he is going to do than he has. Nothing he has done can have surprised anybody who listened. How many of those unhappy with Bush bothered to vote? What I find most interesting in the chart is the change in seasonal variations. In 2003 the spread was about 5 MMbpd and in 2005 it was only about 1 MMbpd. Is this change a clear signal that we are very close or even past The Peak.